Telangana : A TRS polling agent has been arrested for taking a picture inside an EVM strongroom along with the machines. 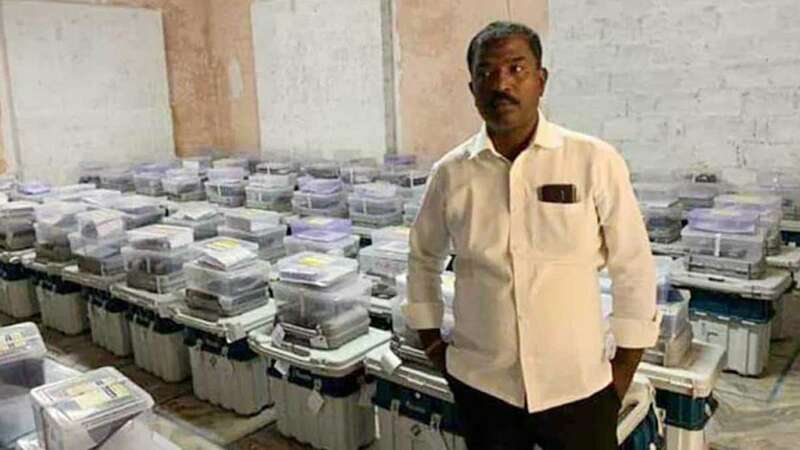 N Venkatesh, the polling agent of Malkajgiri Lok Sabha constituency candidate Marri Rajasekhar Reddy, has been captured posing with the EVM machines post first phase of elections in Telangana on April 11. The cops arrested him after his photograph went viral on the social media. It is believed that the picture was clicked at the time of storing EVMs and Voter-Verified Paper Audit Trail (VVPAT) gadgets at Holy Mary College in Bogaram. A case of criminal trespassing has been registered against him. As per rule, clicking a picture inside the EVM strongroom is not allowed. Only election officials are authorised to that. Marri Rajashekar Reddy, son-in-law of sitting MP and minister Malla Reddy, is up against Congress leader A Revanth Reddy and BJP's senior leader N Ramchander Rao in Malkajgiri. With over 31.50 lakh voters, Malkajgiri is considered a ''Mini India'' due to its diverse population.